The chipmunk-cheeked Joe Shishido leads up this 1967 "borderless action" film from Japan. 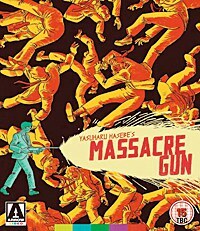 Massacre Gun is a widescreen, black and white, Japanese gangster movie from the era when Nikkatsu Studios was turning out dozens of such titles in the sleek "international" style they called "borderless action". The story is as formulaic as possible: Two brothers are members of a yakuza gang, while their youngest brother is an aspiring boxer sponsored by the boss. In the opening sequence, the oldest brother (the ubiquitous and distinctive Joe Shishido of the surgically-altered chipmunk cheeks) is ordered to kill his lover because she's really the boss' girlfriend. He does so, and this causes the youngest brother (Jirô Okazaki) to diss the boss (Takashi Kanda), who has the boy's hands crushed. In other words, it's an escalating series of vengeful ping-pong moves that can only end with lots of corpses. The "massacre gun" turns out to be a high-powered rifle used in the final shoot-out on a bridge under construction. Despite the presence of various women, it's really a complex dance of romance and loyalty among men: brothers, best friends, colleagues, gangsters. Their posturing, self-defeating, nihilistic tragedy is that they have "no choice". Now and then, a woman will try to talk sense into somebody, and this will be staged for effect on a speedboat or in a car or with the miniscule couple in a corner of the screen, overwhelmed by sky. It's all very stylish, and that's what director Yasuharu Hasebe offers to make the predictable story at least worth looking at. The trailer trumpets the "cool" style, exemplified by Ken Sanders as a mixed-race piano crooner in the brothers' nightclub. Tatsuya Fuji, who plays the middle brother, would star in the notorious In the Realm of the Senses. In a bonus interview, the aged Shishido (cheeks no longer prominent) hardly has anything to recall about this movie, except for saying that the director let him devise the shootouts. The yakuza film he remembers as his best is A Colt Is My Passport, which is in the Nikkatsu Noir box from Criterion's Eclipse series. He also fondly recalls Seijun Suzuki's Branded to Kill and the prostitution melodrama Gate of Flesh, both also from Criterion.